It may seem crazy to start thinking about the holidays again just as we’re starting to commence the new year. Let’s be honest, after the rush, chaos, extra poundage, and all-around craziness that goes along with the holiday season, the last thing you want to do is think about the new year’s Thanksgiving, Christmas, or next year’s New Year’s. However, if you’re anything like most people, you find yourself, more often than not, surprised by the holiday season. You probably go into fall convinced you still have plenty of time to save up. You barely start thinking about gifts and doing all your shopping and cooking. The next thing you know, it’s December, and you’re in a mad rush to complete it all. You may also find that your funds are often lower than you’d like them to be when it comes time to pay for all the holiday necessities. It’s easy to keep telling yourself that you still have time until you’re actually crunched for time. Which is exactly why you should start saving for the holidays now. 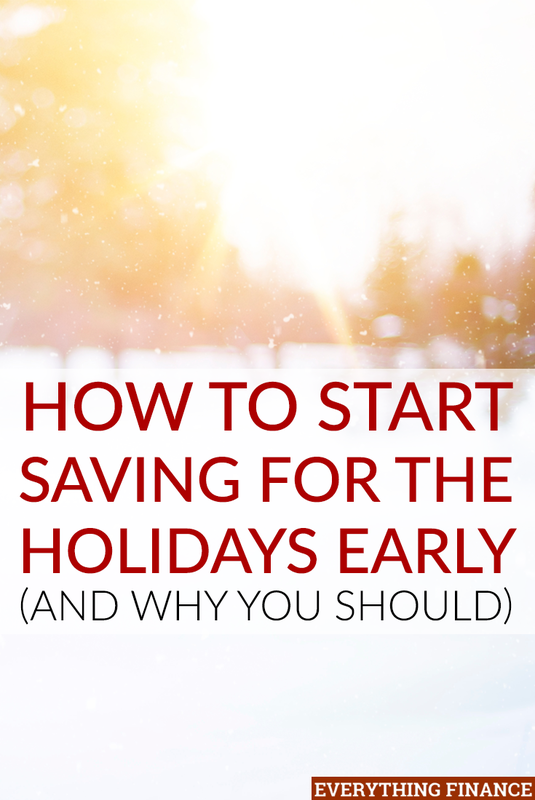 Instead of feeling panicked over your lack of cash, start saving now so you can go into the next holiday season prepared. Here are some ideas to help you start saving today. One of the hardest parts about saving is knowing how much to save for your holiday budget. The longer you go without thinking about holiday expenses, the more chance you’ll have of forgetting something. Start making a list now, while it’s still fresh in your mind, of everything you had to purchase during the holidays. Include everything from gifts to food to travel and decorations so you know you’re covering all your bases. Look back over all your receipts and statements from this past holiday season to get a ballpark number of how much you spent this year. Doing this will give you a goal for the next year as well. Even if it’s not exact and you end up spending more or less, you’ll at least be mostly prepared. Plus, it’s always easier to start saving when you actually have a specific end-goal in mind. The beauty of starting to save for the holidays now is that you only have to save a little here and there, instead of large chunks all at once. Set up an automatic transfer for a little bit of your income to come out and go into a dedicated holiday savings account each month. Once you’ve figured out your amount to save, divide it by the numbers of months you have left and set up the transfer. Not only will the deduction be unnoticeable due to the fact that the amount will come out of your paycheck before you have a chance to really see it, but it’ll also be unnoticeable because the amount itself won’t be as large if you start right away in January. Another great option for saving is to start a separate savings account that has a higher interest rate with an online bank, like Ally or Capital One 360. The higher interest rate will enable you to grow your account quicker than if you were to keep your savings at a traditional bank, and it might mean that you don’t need to save as much each month as you originally thought. Furthermore, by utilizing a separate online account that’s in a bank different than your main one, you’ll be far less tempted to dip into your savings on a whim. After all, sometimes the hardest part about saving is actually keeping the money in your savings. Many banks and credit unions also offer great options in the way of a savings club. Banks like Nationwide even offer holiday specific savings accounts. Unlike an account with high interest, the point of these accounts is more to keep your money locked away until you need it as opposed to accumulating a lot on the interest front. Some of these accounts even prevent you from taking money out until the holiday season starts. Plus, these accounts are for the short-term instead of the long-term, so instead of opening an account you might not need after the holidays, you can open a savings club, save and use it while you need it, and then be done with it. Until next holiday season, of course! Apart from utilizing specific accounts and methods of saving, the best way to save is to plan ahead as soon as you can. While you should still opt to create a separate savings account, there are other ways to lessen the blow of holiday purchases. You may feel tempted to wait until November or December to start purchasing gifts in order to hit the sales. But, for the most part, the majority of holiday sales don’t save you as much as you’d think. Instead of waiting until the week or two before Christmas, make gift purchases here and there over the span of a couple of months. You’ll not only have plenty of time to shop around for a great deal, but it’ll also give you the option of spending smaller amounts over a prolonged period of time. The same can be said for holiday décor. You may be able to buy some now while items are on sale, instead of buying new decorations next winter. Trying to think about the holidays months ahead of time can be difficult to do, and saving for them seems even harder. There’s most likely expenses and purchases that’ll make putting money away for Christmas seem impossible. Nonetheless, if you start now and get ahead of the game, the small amount every month won’t seem so bad. Besides, when it comes time for the holiday season, Christmas shopping won’t be as impactful financially or be quite as stressful. You might actually be able to sit back, relax, and enjoy the eggnog. What are some of the ways you save for the holidays? Will you start saving for the holidays now?